Cruise ship passengers likely prefer to do their swimming once they're off the boat. But one group of passengers got an unwelcome surprise on Thursday when a water line break on their ship flooded 50 staterooms. The Carnival Dream was on a seven-day cruise in the western Caribbean after departing from New Orleans last Sunday when the incident happened, according to Carnival Cruises. The water came from a break in the ship's fire suppression system, the cruise line said. Video showed gallons and gallons of water rushing out of pipes in the hallway on Deck 9. Passenger Maria DeAnn Haase shared video of the flooded hallway as well as crew members attempting to bail it out with buckets. "We are flooding on a cruise," Haase wrote on Facebook. "We heard the violins and the silverware all come crashing down. What in the world." The cruise line was quick to clean up the mess, and said the next cruise would not be affected. Passengers who were impacted by the water line break will receive a 100 percent refund, 50 percent credit toward a future cruise trip and were given the option to fly home on Friday, according to Carnival Cruises. "We appreciate our guests’ understanding and sincerely apologize," Carnival said in a statement. "We also thank our crew members for their quick action and hard work." 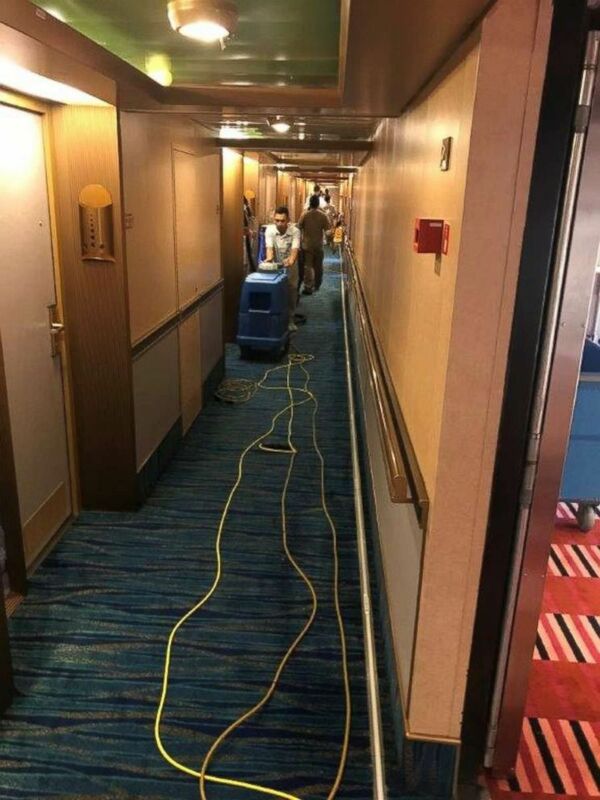 The cruise line shared photos of the ship's hallway all cleaned up following the flooding. Carnival Cruises was quick to clean up after a water line break flooded 50 rooms on the Carnival Dream on Thursday, May 3, 2018. The Carnival Dream was launched in 2008 and can carry over 3,500 passengers. Trips to the western Caribbean can include stops in Cozumel, Mexico; Grand Cayman; or Belize, according to the company's website.